Anthony mentioned this video to me today because he likes to mess with it and when you see it, you’ll know why. Here’s the setup. This was shot back in 2009 after we finished eating dinner on the patio, a dinner consisting of enchiladas and a few side dishes. We had one enchilada left so I decided to have a little fun with it by setting up my camera and letting Arliss do his thing. He was begging the whole time during dinner so I figured I might as well let him have it. I set the camera on the table, started the video, and left the enchilada on the table so that he knew it was there. I then went into the house and kept an eye on things from inside. The result: Arliss having a nice dinner. Note that it’s quite for the first 50 seconds or so; the action takes place after that. I like how at 1:02 he looks into the house to see if I’m coming then at 1:09, he knows he busted. He wasn’t really but it’s funny to see. And why does Anthony like this so much? He enjoys making Arliss “barf up” the enchilada by dragging the marker backwards when he watches the video on Quicktime. I’ve had various keyboards over years and most of the time, they’ve laid untouched and collecting dust. But when I do sit and try to play them, I really am capable of making something that resembles music. But it’s never my own composition. See, I can play by ear and play back just about anything I’ve heard after only a few tries. It takes a few more tries to polish it a bit but there will be no doubt about which song I am playing. Today’s song is no exception. I taught myself how to play this one – Ann calls me “one of those people” – and I have to admit it’s pretty close to it. I won’t, however, sing along unless I’m alone. Maybe. Note that I have no idea what’s going on between 2:41 – 3:14. That’s both a question and a title of an album by Reel Big Fish, the group who performed today’s featured song. In it, one of the guys discovers that the girl he once dated, well, doesn’t like guys anymore. Um…wow. That’s pretty deep yet amusing at the same time. But hey, don’t let me tell the story. These guys do it much better. We got to Disneyland at 8 a.m. on Sunday so we could enjoy what we thought would be a relatively “quiet” day in the Park. And for the most part, it was. 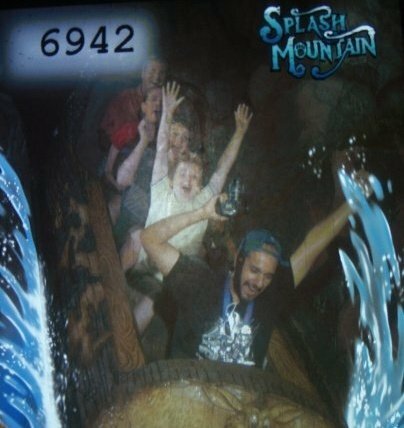 Hey, I got to sit in the front seat on Splash Mountain and there was no line, either. In fact, while walking through Frontierland I decided I’d stop to take a picture of the shooting gallery. I figured that since there was not one person playing the game and it’s usually pretty crowded otherwise, this would be the perfect opportunity to get the shot. So I stood there, took aim and pressed the shutter. And that’s when it happened. The whole thing reminded me of episode of The Simpsons when the family goes to Itchy and Scratchy Land and the robots go crazy with the camera flashes. Now, I could have stood there and throughly entertained myself for hours on end but hey, The Kid wanted to go see Jack Skellington’s Haunted Mansion Holiday and I can’t blame him for that. A few passersby were also getting laugh out of it so I wasn’t the only one being entertained by the shenanigans. So the next time you go to Disneyland/Disney World, give it a try. Just, you know, make sure there are no Disney Cops around when you do. * A rare occasion. We usually only take one camera.